Breitling has introduced the Navitimer 1884 in a limited series. The watch combines the 1952 aviation slide rule with a calendar featuring a pointer-type date display and twin day/month apertures for which the brand is known. 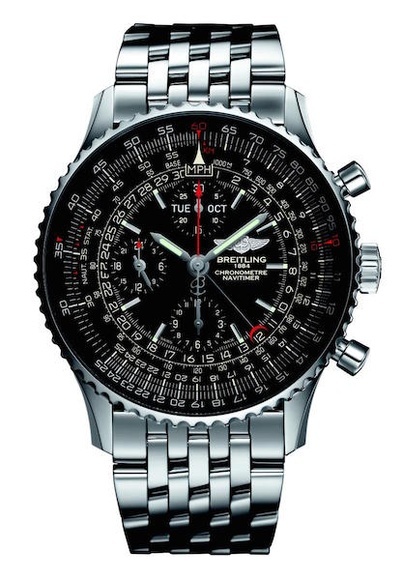 The 1884 is a nod to the founding of Breitling by Léon Breitling, a devotee of chronographs and precision instruments. This model also features a practical detail in the shape of a 9 o’clock small seconds subdial, providing an additional 24-hour “military-time” display favored by pilots, according to company officials. Issued in a 1,884-piece limited series, the Navitimer 1884 comes with the choice of a bracelet or a leather or crocodile leather strap, as well as a new black rubber strap featuring an aircraft tire-tread motif.